$65.00 In stock. Order in the next 1 hour, 55 minutes and it will go out today! When we released the original AmazeBox last year magicians across the world immediately recognized the countless uses for such a clever utility prop. Since its release it has been used on some of the largest stages in the world by thousands of magicians, including a number of famous performers. We got two important pieces of feedback from the professionals that used AmazeBox in their show: they’d like it to contain more billets and they’d prefer it to be black and not white. Not only is the AmazeBox MUCH bigger (it can hold 200 slips of paper instead of just 30) but it is also stronger. Steel plates between the cardboard mean that this will last MUCH longer and is better suited to travel and the new matte black color means it will blend in perfectly in any environment. After weeks (yes, really!) of re-designing, we have now made it so it fits back into it's packaging so you can transport it flat wherever you go. The box, when flat, it will fit in any large suitcase. 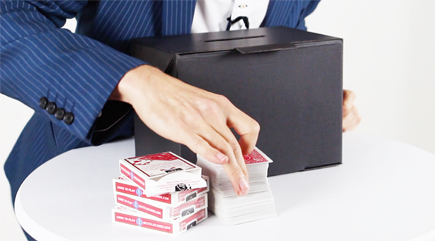 Have a failsafe method for switching paper, playing cards, and more! In a 45 minute online video, Mark Shortland takes you through everything from assembling the box, to routines and more. If you have a place for the original AmazeBox in your show, the AmazeBox Black will change everything!